Brandon and Dan getting warmed up. 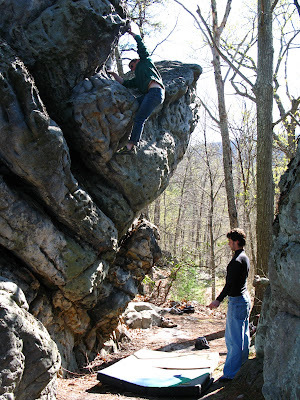 I spent this weekend out at Hunter Rocks in Central Pennsylvania, one of the most incredible bouldering spots I've been to. It's a little piece of heaven in the form of gritty sandstone in the middle of Amish country; a well-kept secret, and with good reason. 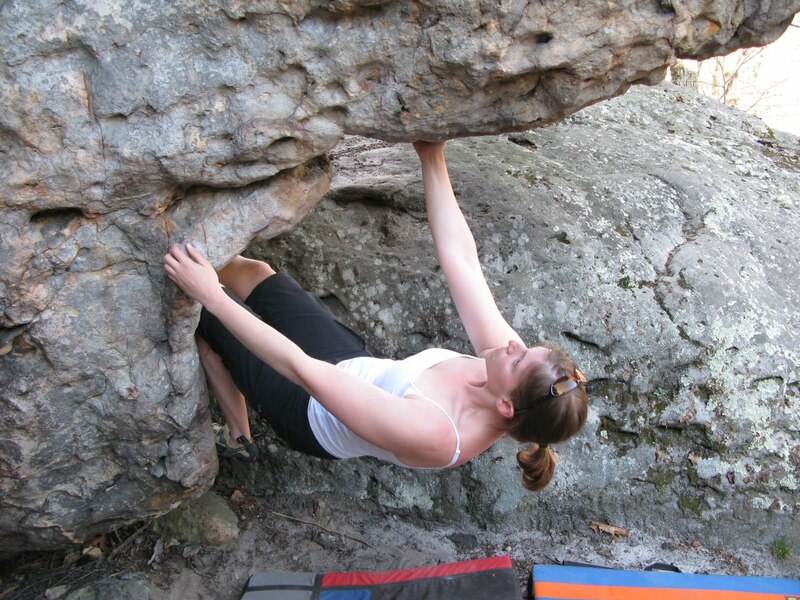 There's a history of access issues, which stems from a good portion of the climbable rock being located on private land. I felt lucky to have veteran Hunters climber Brandon, a friend from the gym, suggest a trip there and invite us along. Three of us drove out Friday night, arriving at the state forest campsite after 11pm. Dan and I had been in a bit of a rush packing, and I was convinced we'd forget something important. Turns out we'd forgotten the fuel bottle to my MSR stove, and Brandon generously let us use his for the weekend. If he hadn't, we'd have spent the weekend staring longingly at all we brought that needed to be cooked. While we set up camp, I understood why Brandon was so excited to get there. The absolute remoteness of the place was incredible, and beautiful. We set out for the main climbing area just after 10am Saturday and I couldn't believe the quality of the rock. Enormous mounds of sandstone, weathered by wind and rain, perfectly formed for bouldering, were everywhere. Weathering left little pockets, cracks, and holes in the sandstone, and we spent the morning making up as many lines as we could. Given the access issues, the area isn't well named and guides are few and far between. But sometimes, making up lines is half the fun! The rest of our group arrived midday, and the afternoon absolutely flew by. We took a short food break back at the campsite, then moved on to the other area at Hunters - Power Cut. These rocks will rip up your hands, no doubt, but you'll definitely have a good time! Power Cut is aptly named; the boulders are situated at the top of a long hill where a strip of trees had been shaved off to make room for power lines. We found what we thought was a V0, according to Brandon's printed guide, but it turned out what we picked was significantly tougher. We spent the rest of the day working it - a beautiful overhanging arete with little finger pockets, heel hooks, and some of the grittiest most unfriendly rock I've climbed on. Dan and our friend Carlos affectionately named it Morla's Nose. I gave it a few good tries, but had a lot more fun watching the rest of the group's success on it! All in all, it was an amazing day. I topped out on some easy, but incredibly high problems that resulted in my experiencing the same scared-to-death feeling I get while leading, which made me feel great, and spent time with some great other climber folk from the gym. I woke up Sunday morning with the nagging feeling that despite how great the rock climbing had been, I needed to start buckling down and training for mountain climbing. With four months left until the Rainier Summit for Someone climb, I primarily have two fears. (1) I won't be in good enough shape, and (2) that I'll have trouble with altitude. Only one of those things is completely in my control, and I've got to make sure I'm in the best shape I can be. I have a training plan and the resources to act on it, I just have to...act on it! So instead of strapping the crash pad to my back and heading to Power Cut with Brandon and Dan, I loaded up my pack, grabbed Dan's Garmin, and set out on a 5.3 mile 2 hour "hike." One of my favorite things about being outside in a place like the Rothrock State Forest is the solitude. Granted, we ran into people all weekend, but I still really enjoy feeling as though I'm completely by myself once in a while. The approach to Power Cut turned out to be perfect for solitude, and for Rainier training. I lost track of how many times I did the approach, but reached my requisite 1400' of elevation gain for the weekend. * In the process, I tried to be as mindful and self-aware as possible, recognizing where my mind wandered and keeping negative thoughts in check. I firmly believe anything that tests my mental reserves, including climbing, will help prepare me for Rainier. By setting a goal of 1400' elevation gain, and breaking it down into ascents and descents of the approach, it made the whole process much easier to manage mentally. Sunday, just like Saturday, was exactly what I needed. I knew I'd have felt guilty all day if I'd skipped my hike and bouldered instead, feeling as though Saturday's climbing was successful. Staying in balance, and listening to what my body's telling me I need to focus more time on is critical. I recognize that Rainier's going to be incredibly difficult, and that I need to shift my focus to doing everything I can to prepare. I was absolutely exhausted by the end of the hike, and walked up to find Brandon and Dan exhausted from a second day of bouldering. We left with cuts, scrapes, red fingertips, and smiles. I can't wait to go back! 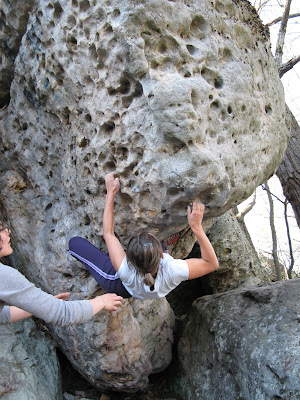 Sounds like a great time both bouldering and training wise! Keep up the good work on the training. You'll do great. Love Hunters! I went to Penn State so this was our local bouldering spot. Great place but it takes a toll on the skin. Like you said...gritty. I always stayed on the Power Cut side because I had heard stories of the property owner chasing climbers off of the "main side" with a shotgun (bouldering pads don't make great body armor). So much good rock there, just need a brush. 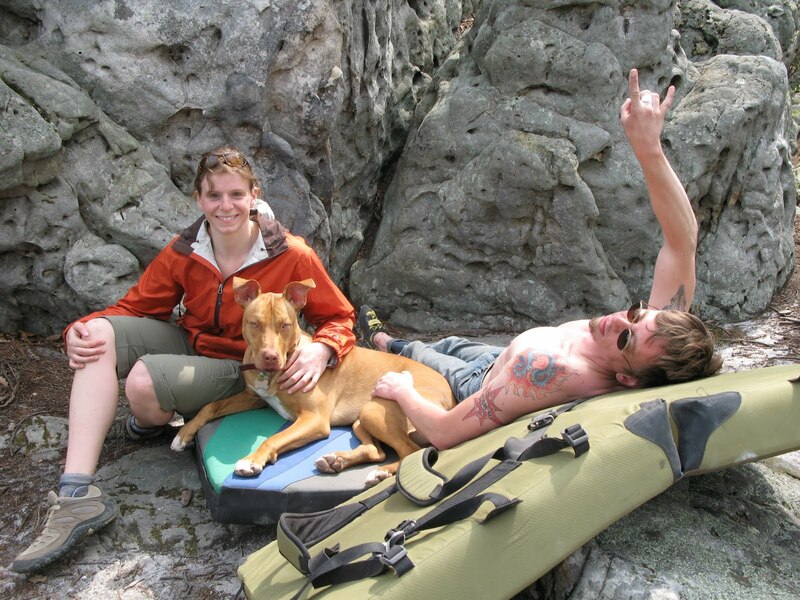 hehe, yeah...we met that guy, and he told is a few stories about some of his past interactions with climbers. it's tough, it's a beautiful climbing area, but it's obvious that folks have done a good job of overstepping their bounds in the past. but Power Cut has plenty to keep you busy! we should plan a return trip. Awesome! I think sandstone is my favorite type of rock to climb on. Granite is just so harsh, sandstone is way more tender on the fingertips, haha. I'm used to going to heavily developed areas, but it would be a blast to check out a crag where I'm free to make up my own lines. Agreed! This place is so amazing because it's not often you find sandstone around here. And yep, sometimes it's a lot more fun when you don't have grade and line expectations going into a trip. C'mon up and visit!